National Victims and Survivors of Crime Week brings focus to issues and resources available for victims, survivors, and their families. The BC Bereavement Helpline has held events during this week, in turn highlighting the resiliency of survivors and bringing awareness to existing services. For more on National Victims and Survivors of Crime Week, click here. BCBH produced an original 5-part podcast series, “Voices of Resilience,” in support of National Victims and Survivors of Crime Week, May 28 – June 3, 2017 telling the stories of fiveindividuals affected by crime and how they responded with resiliency. Listen to Jessica’s story of fighting back in the face of the loss of her sister to homicide, followed by her experience through the resolution of the 30-year-old cold case. Listen to Tamara tell the story of her brother’s tragic murder and the resulting “alchemy” of the Daniel Pearl Foundation and her own happiness. Hear how Meghan, healing from a recent sexual assault, describes resilience as something that looks different each day – two steps forward, and one step back – and vows that she will not allow this experience to take over her life. In the aftermath of her niece’s murder hear how Jo-Anne has advocated for Kimberly’s Law, legislation that proposes changes in laws to protect our young people and society by preventing further tragedies and providing help for at-risk youth. Hear how Carol turned to Restorative Justice, and received support through the Community Justice Initiatives Association, to forgive the murderer of her son. For National Victims and Survivors of Crime Week 2016, the BC Victims of Homicide, along with our partners, hosted a two-part event on Victim Impact Statements. Victims and families are not personally represented in the court system and often feel, as a result, that their voices are silenced. 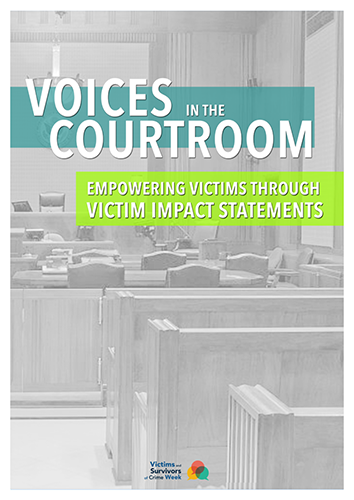 Raising awareness of the value of Victim Impact Statements can help bring the voice of the victim back into the courtroom, help the community realize the impact of a particular crime on individuals and society, and be a healing tool for some. The Victim Impact Statement then becomes a part of everyone’s journey as we understand the consequences of a particular act and see how it has affected an individual, a family, and a community. The event was held Monday, May 30th, 2016. The second part of the event was a workshop led by Lovepreet Brar on writing a Victim Impact Statement. The first part of the event included a series of presentations from the perspectives of a victim/survivor, perpetrator, restorative justice practitioner, and a judge; those are available for viewing below. We acknowledge the financial assistance of the Department of Justice Canada Victims Fund. A forum was held on April 25, 2015 to bring together victim family members, criminal justice professionals and other service providers who are involved when a homicide occurs. This forum allowed for dialogue and engagement to promote better understanding of the challenges and limitations that professionals and families face after a homicide.